It had rained incessantly for two days and I was stuck in Koksar, 45 Kms before Keylong. On the third day, the rains subsided and though the sky wasn’t clear, there was absolutely no rain. As I rode out to Keylong, the sun peeped through the dark clouds for a while before disappearing again. Going past the stream crossings, Pagal Nalla and Turning Nalla, I headed to Keylong. Spectacular landscapes looked gorgeous after the rains with ice capped mountains, waterfalls and green patches. While Spiti has garnered all the attention over the years, Lahaul- its silent partner has been witness to numerous visitors heading past her to other destinations such as Spiti and Ladakh. Keylong at 10,380 feet is often referred as the gateway to Lahaul, and along with Udaipur forms the major towns of Lahaul. Ruled by Kashmir, Chamba and Tibetan rulers, the land also has a mix of various races. Keylong is the district headquarters and also acts as a major stopover between Kullu valley and Ladakh. Riding from Koksar, the first major attraction was Sissu falls which is a huge plunge falls by the road at Sissu village. The surrounding greenery and the mountain backdrop accentuate the charm of the beautiful falls. Further ahead, I stopped at Tandi where lies the confluence of Chandra and Bhaga rivers. The brown waters of Chandra and the green waters of Bhaga joins to form Chandrabhaga river which later becomes Chenab river, the most voluminous river to rise in India. The confluence is beautiful and waters of both the rivers are distinctly visible and can be easily discerned. Keylong has quite a few secluded monasteries and Kardong monastery is one of the prominent ones amongst them. It was a lonely ride up the winding mud road from Keylong to Kardong, which was the capital of Lahaul in the 12th century. Beautiful views of mountains and the confluence gave accompaniment all the way till fluttering colourful prayer flags showed up. Situated along the slopes and ridges of Drilburi Mountain is Kardong gompa. As I walked down the steps to the monastery, an old fragile looking nun guided me to the main temple, where a young lama showed me around. 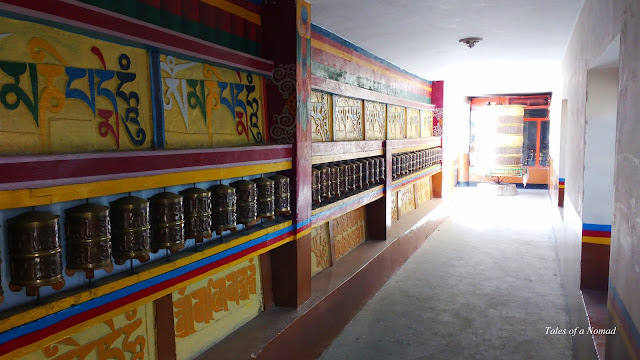 Lined with prayer wheels along its periphery, both the interiors and exteriors of the monastery are colourful. Believed to be more than 200 years old, the main statue of Buddha is made of clay and the monastery follows Lho- Dug sect of Buddhism. I was told by the monk that there are about 30 resident monks at the monastery. Down the road and atop another mountain lies Shashur gompa, another isolated monastery near Keylong and the most important one in Lahaul. The spiraling road went past many curves and bends to the 17th century Shashur gompa. The two storeyed structure has numerous small prayer wheels and a large one in the small courtyard. The monastery follows Drugpa sect of Buddhism and has carved colourful wooden doors and window panels. The gompa has a fifteen feet long Thangka (Buddhist painting) and numerous wall paintings. The inner sanctum also houses the statues of Shakyamuni, Padmasambhava and Tara. The monks were busy with their daily chores and I walked around alone. The views from the upper deck are beautiful. Back in Keylong town, I rounded off my visit with a stroll through the market which is lined with numerous shops and small eateries. 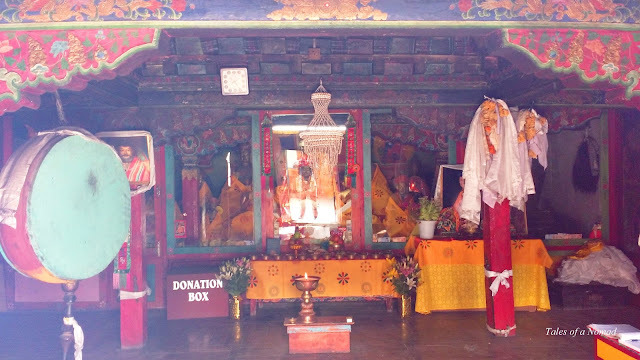 Tayul gompa and Guru Ghantal gompa (oldest in Lahaul) are the other prominent monasteries in Lahaul. 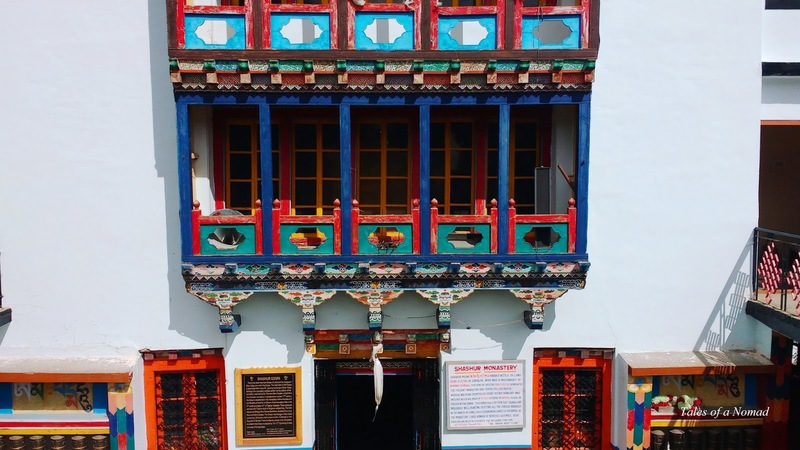 The museum of Lahaul and Spiti has an interesting display of traditional instruments, attires, lamps and photographs of various tourist attractions. Keylong is 116 Kms from Manali on Manali- Leh road. The nearest airport is at Bhuntar (168 Kms) and the closest railhead is at Chandigarh (431 Kms). There are regular buses from Manali to Keylong, except during winters. Rohtang pass which lies between Manali and Keylong closes during the winter months from November to May. There are numerous food stalls and small eateries in Keylong market which serve both Indian and Tibetan food. Keylong town has both budget and mid-range stay options. Kardong monastery too offers rooms for travellers. I have done a night halt in Keylong way back in 2005. Since then I want to go back! I can see that you had a wonderful trip! Am sure Keylong must have been way different then. Beautiful landscapes and attractive monasteries. What a great combo. I can see it was a great trip. Btw -- I love that first pic!!! !